Hello! It's Kara and I hope everyone has had a wonderful holiday season. As we approach the new year I like to send out my holiday thank you cards. I don't send out a ton of them, but I especially like to send a thank you to family and friends far away who have sent me a gift. I'm not able to give them a hug in person so a handmade card is the next best thing! 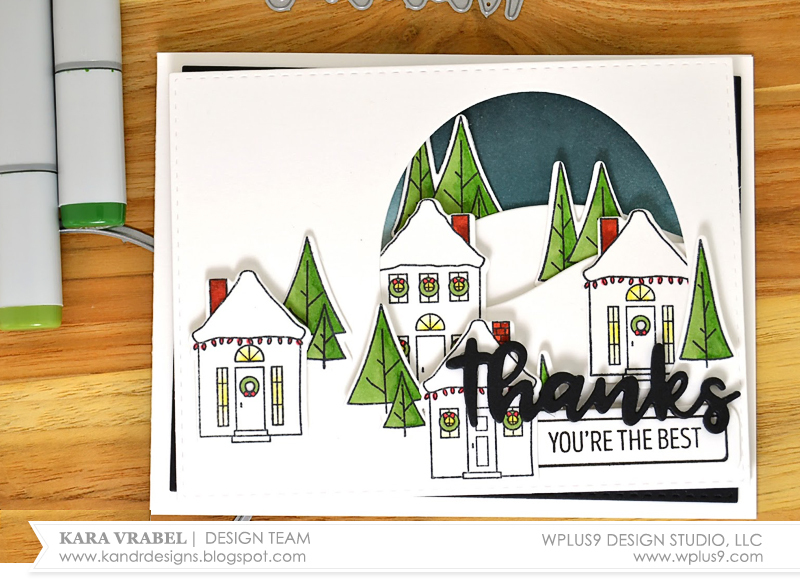 I couldn't resist making another window card scene with the adorable Holiday Houses stamp set. I started by die cutting two white panels with the same size rectangle die. In one panel ;I die cut a window using the large oval from Basic Labels Dies. I positioned the window panel on top of the second panel and traced the inside of the oval with a pencil very lightly. This way I knew exactly where to apply my distress inked evening sky. 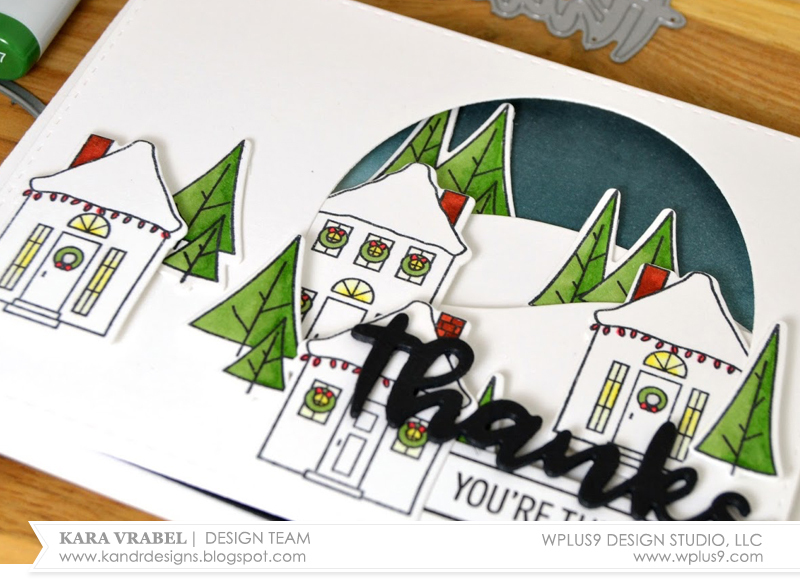 Once my sky was compete, I die cut a few pieces of cardstock with the Landscape Border Die to create my snowy hills. I adhered them together with thin dimensional adhesive so as not to add too much bulk, but still create dimension. I was then able to tuck in all of the tiny houses and trees to create my village. 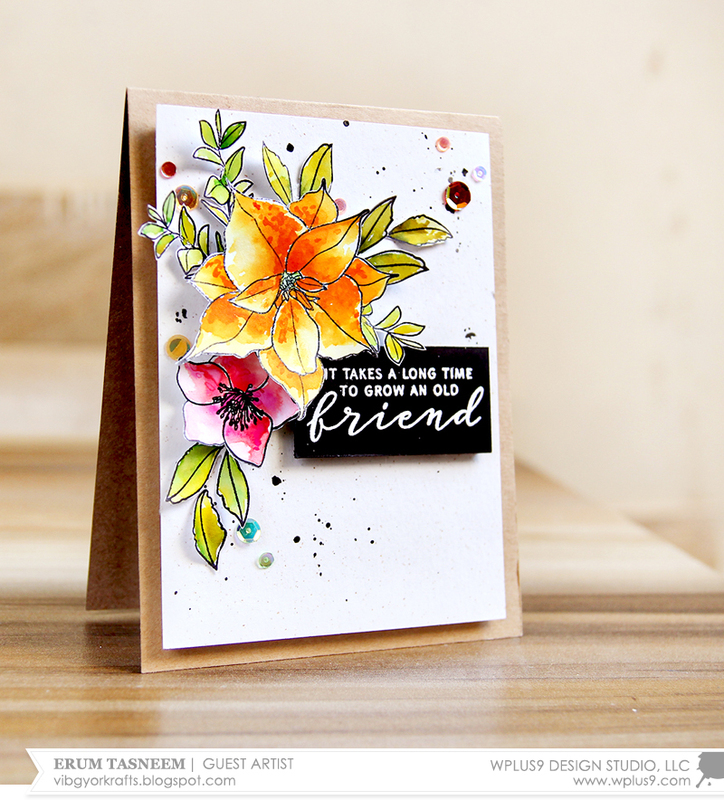 I used the Basic Greetings Die to die cut the word Thanks several times and adhered them together to create a chipboard-like embellishment. 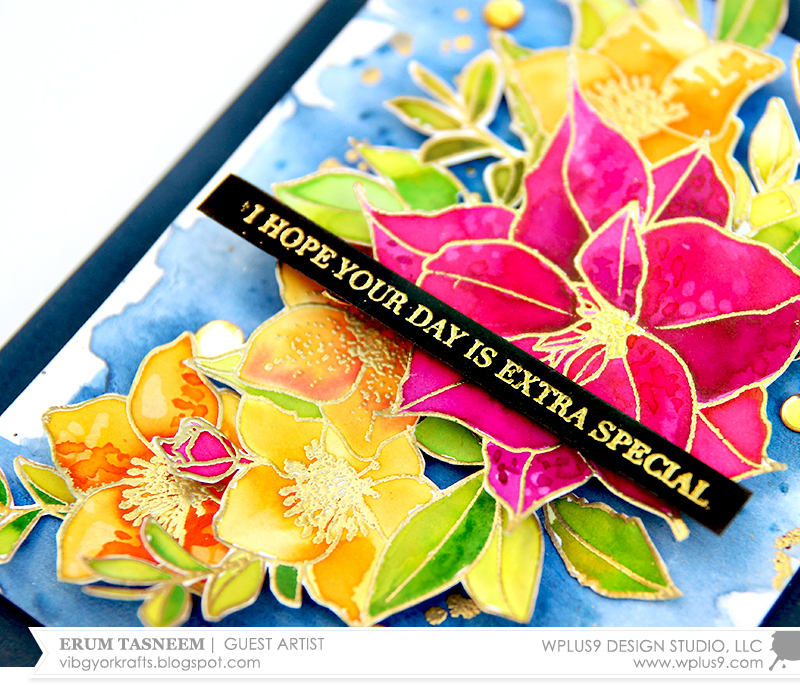 I used a few more bits from the Basic Labels stamp and die set to create the secondary sentiment. Thanks you so much for stopping by today. Happy New Year! See you in 2018! Valentine’s Day cards, I think, are not just for the love birds, but can be given other people - friends, family, even co-workers. 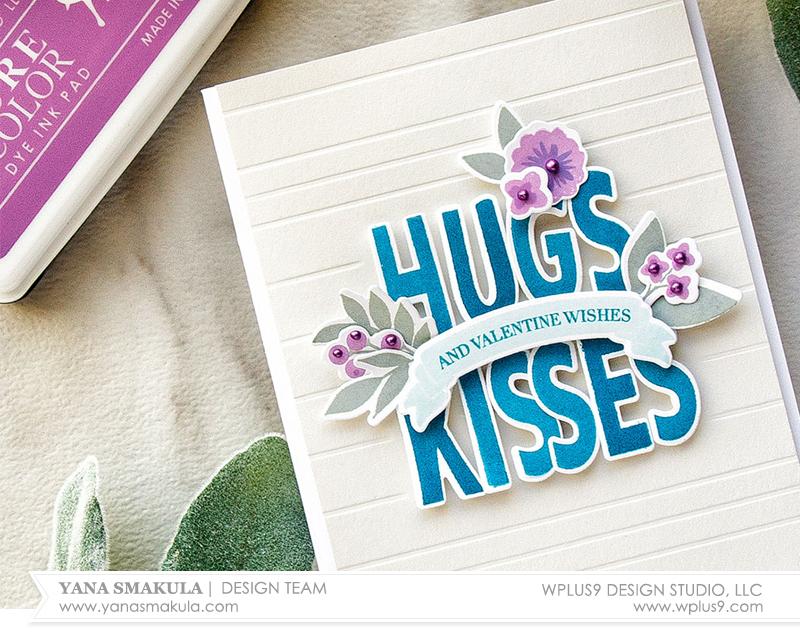 Hello friends, this is Yana and today I’m sharing an example of such a card created using some older products from WPlus9. 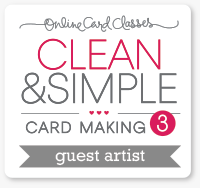 I filmed a video tutorial showing my cardmaking process from start to finish. 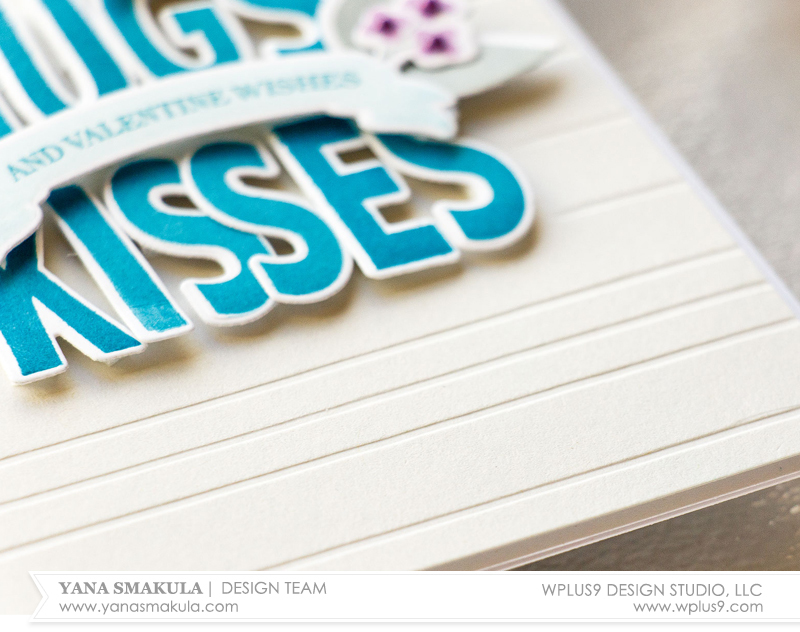 I wanted to use “Hugs & Kisses & Valentine Wishes” sentiment from the the Valentine Wishes stamp set for my card. 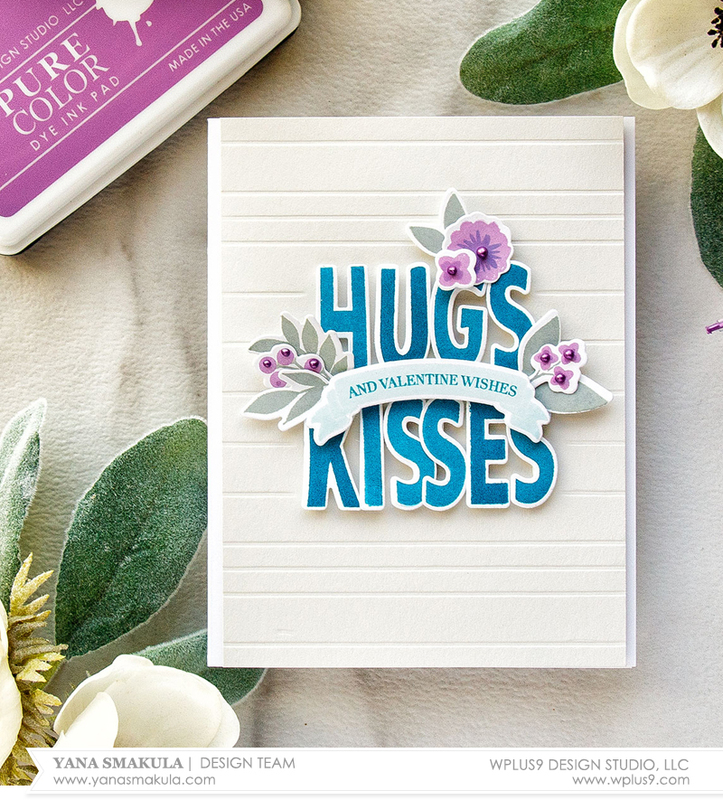 I decided to alter the sentiment a bit and use large Whimsy Alpha letters to spell Hugs Kisses. 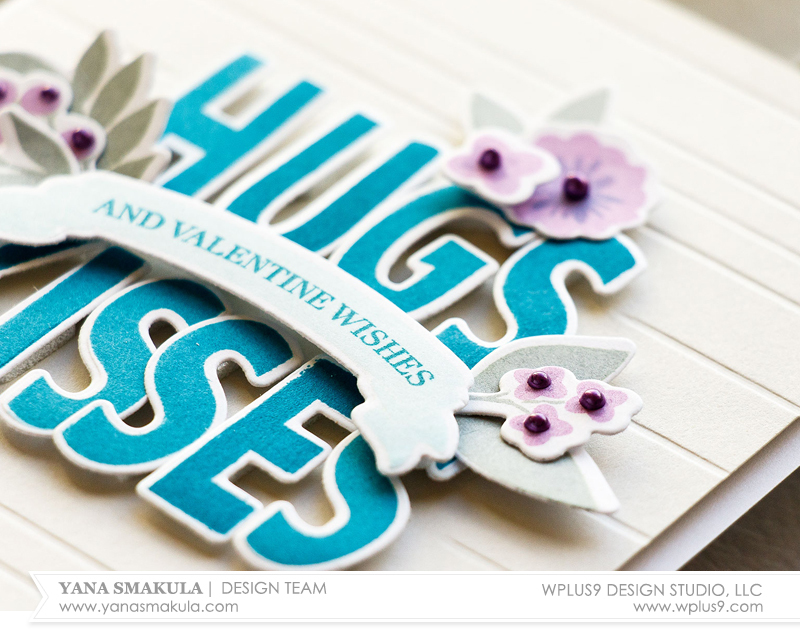 I stamped my letters in Falling For Blue ink, cut them out using companion dies and also created a banner stamped in Lake House with “Valentine Wishes" stamped in Falling For Blue. After foam mounting letters and banner onto a Dove Grey cardstock panel I added selective dry embossing using my bone folder and scoring board just like I did in their post here; I’m rather enjoying this old technique these days - I feel it lets me easily add unique texture to my cards. 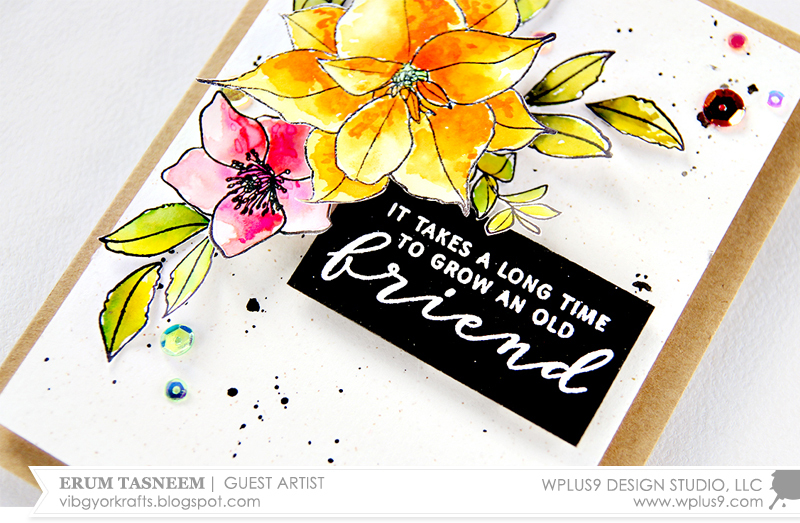 I also stamped and cut out images using Fresh Cut Florals stamp set. I used Silver Lining as well as Bloomsberry and Cockleshell ink colors for my stamping and added little floral details to my sentiment cluster. Hello everyone! I am Erum Tasneem and I am absolutely honoured to guest design for Wplus9. We were originally going to do this back in October and I have been waiting (impatiently) for December since then. Enough with the chit chat, let’s get down to the cards. 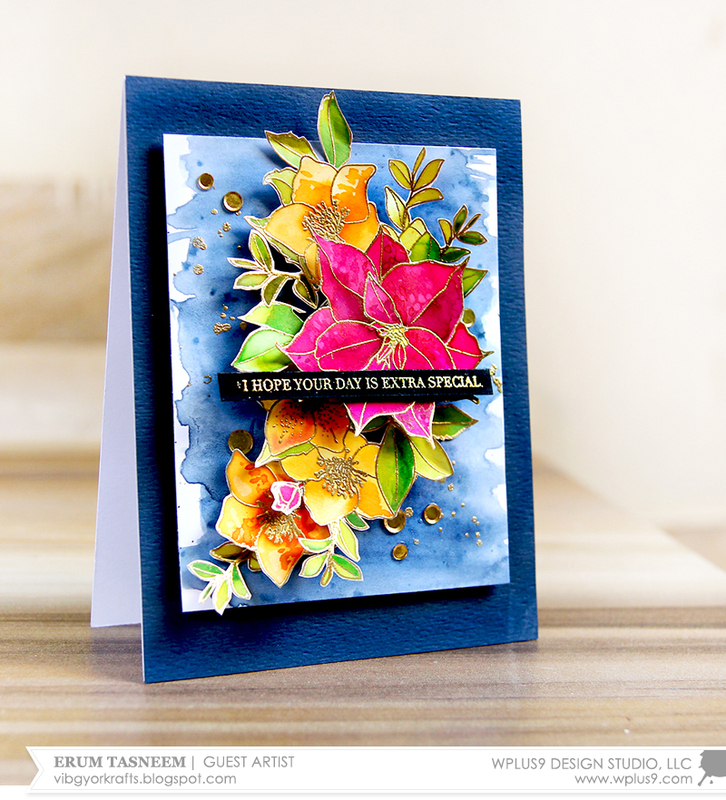 I have two cards to share with you today featuring the Christmas Rose Bouquet stamp set. How gorgeous is this set?! Let’s start with the first card. 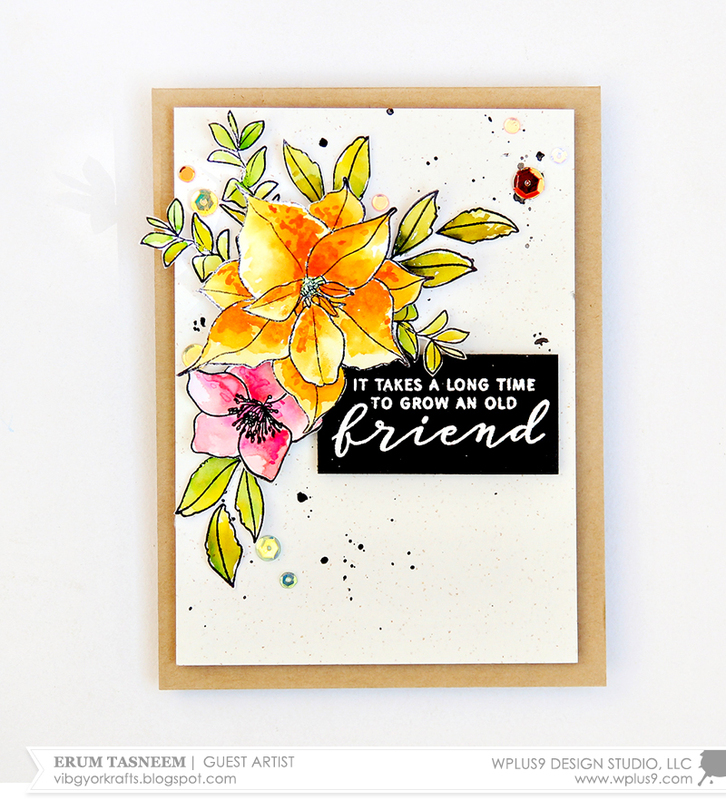 I started off by stamping the floral spray, the single flower, the leaves and the vine onto watercolour paper with Black Dye Ink. 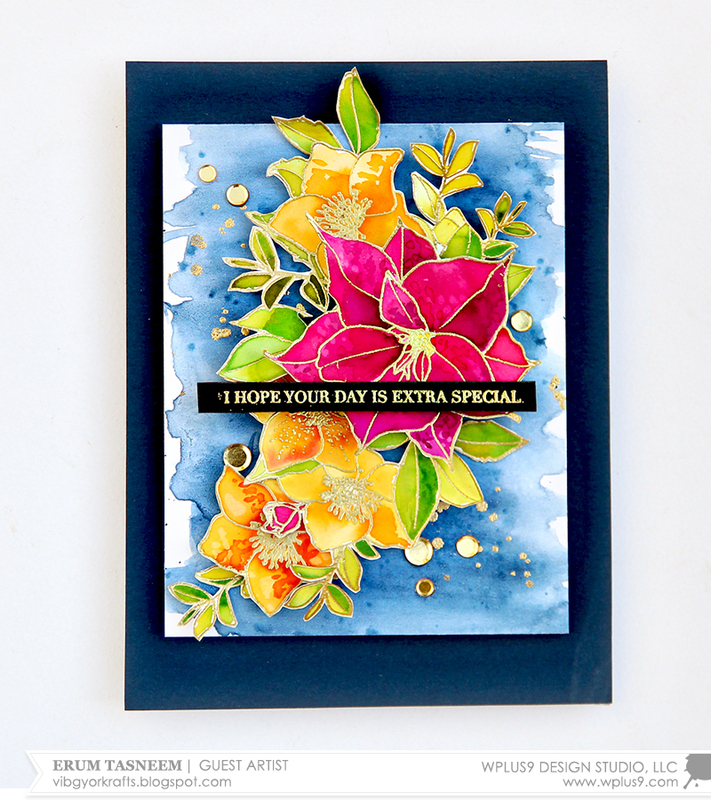 I just wanted to use the Poinsettia from the larger floral stamp and the smaller single Hellebore flower also included in the set. 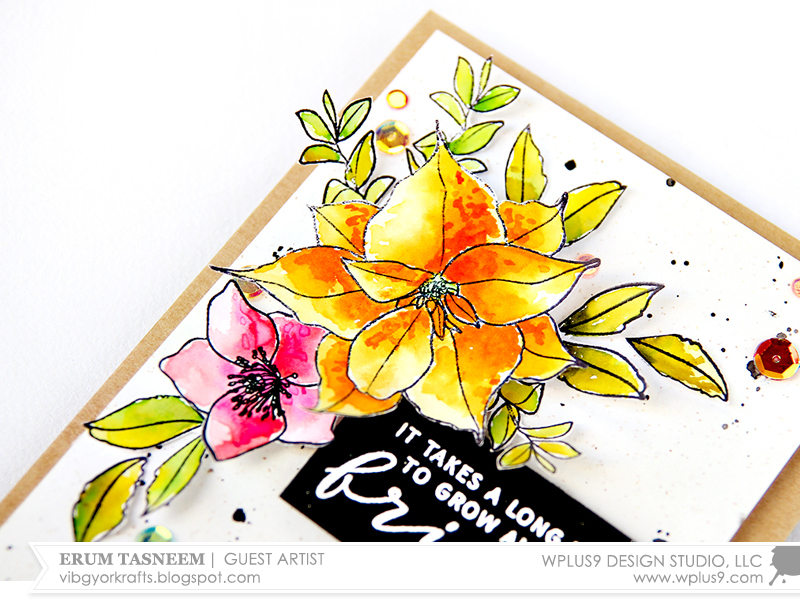 I coloured my images with Tim Holtz Distress Inks and Stains. For the Poinsettia I used Spiced Marmalade and Ripe Persimmon. For the pink flower, I used Work Lipstick and Picked Raspberry. The leaves were done in Mowed Lawn, Crushed Olive, Shabby Shutters and Peeled Paint. After the watercolour was dry, I fussy cut my images out. Next, I stamped the sentiment on black cardstock and heat embossed it with white embossing powder. After this, I prepared my card front by adding a few black paint splatters. I then popped up my sentiment on to the card front with foam tape and started to arrange my floral design. I like to take apart full sprays and make my own version just to add a bit of interest. It's nice to have pre-built arrangements, but don't be afraid to create your own - with a little creative fussy cutting you can really stretch your supplies! I popped up the flowers and leaves all on different levels. In the end, I added some rainbow sequins and confetti for the bling. Now onto my second card. For this card, I heat embossed the full floral spray in gold onto watercolour paper. In addition to this, I heat embossed the single flower and separate leaves as well in case I wanted to add them later on. I watercoloured the images with liquid watercolours and used the sentiment from Strictly Sentiments 4. For my front panel, I coloured a loose watercoloured panel using Gansai Tambi watercolours. Again, I took apart the image by fussy cutting and arranged it the way I wanted to. I popped up everything on foam tape and then popped my sentiment on top of the bouquet. In the end, I added some gold confetti and I was done. I hope you liked my cards and enjoyed the post. I had an absolute blast. Thank you for having me Wplus9!